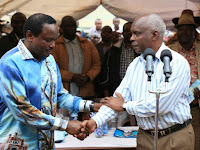 Thursday December 13, 2018-Makueni Governor, Kivutha Kibwana, has said he has no intentions of splitting the Kamba community to the disadvantage of Wiper Leader, Kalonzo Musyoka, ahead of 2022. Speaking at Nziu Primary School during Jamhuri Day celebrations, Kibwana said him being opposed to how party issues are being handled does not mean his fighting Kalonzo Musyoka and his 2022 dreams. He noted that he was being true to his feelings and will be forced into endorsing anything that doesn’t seem right to him. “I’m not dividing Kambas, I can't wish for such a thing to happen," Kibwana said. "Those who know me, more so during the Moi Daniel regime, if I felt something was not right I would say it even if it meant being killed," he added. Kibwana is opposed to the idea of Kalonzo being President Uhuru Kenyatta’s errand boy, saying the position will not help the Kamba community.